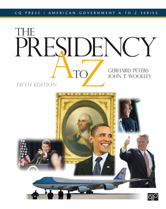 Editors: Gerhard, Peters and Woolley, John T.
The one-stop reference on all aspects of the U.S. presidency, The Presidency A to Z, Fifth Edition is an authoritative and accessible volume providing all the basic information readers need to understand the executive branch. This new and extensively revised fifth edition features important new entries on Barack Obama, Michelle Obama, John McCain, Guantanamo Bay, and War in Afghanistan. It also includes updated entries on Campaign Finance, Iraq War, Presidentsâ relationship with Congress, and many more.